With roots in North Carolina, Julie Shore and Arla Johnson fell in love with Canada nine years ago, and have brought an entrepreneurial spirit and their love of fine spirits to downtown Halifax. Julie comes from a line of distillers and she felt drawn to learning this craft; she eventually made a career change and studied to become a Master Distiller. She began on PEI with potatoes before moving to Halifax to satisfy the population’s rum cravings by crafting small batch spirits using their copper still. 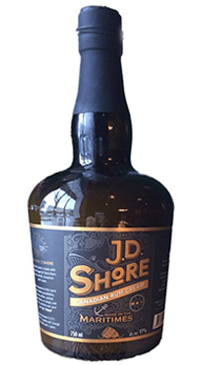 JD Shore Rum Cream is made with barrel aged J.D. Shore Rum, cocoa, vanilla, cinnamon, and cream. The enjoyment of this spirit has endless possibilities. Boozy coffee, cocktail concoctions, or simply over ice. Try a drizzle over your porridge. Enjoy!